Here is the living Chimney Tree we visited, completely hollow inside, but still alive. March 2002. It was raining but we had a blast. Stephentree's Daughter is named Raine. We signed the guest book inside. This was at the very magical Womans Grove where poetry was engraved on the chimney walls. We spent time here, built a fire and produced more Awe-full tapes. We met a woman at the grandfather tree that lived alone in a house with no utilities after loosing her husband. 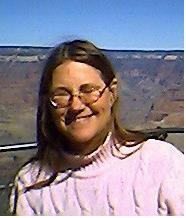 She and Stephentree had many synchronicities about their common experiences and the woman was very touched by the experience This is a picture of Pam at the Grand Canyon and a picture of a bunny. Braden (Pam's Son) was born in the year of the bunny.